The committee of the XVIII World Congress of the International Federation of Translators (FIT) held a press conference Wednesday morning. Huang Youyi, the committee press secretary, also Vice President of the China International Publishing Group, gave an overview of the Congress and talked about the preparations for the congress. The press conference also announced that Beijing Yuanpei Translation Co. Ltd would be the exclusive lead sponsor of the Congress. Huang Youyi, the committee press secretary, also Vice President of the China International Publishing Group, gave an overview of the Congress and talked about the preparations for the congress. The Congress will be hosted in Shanghai, from 4 to 7 August 2008. “It will be an influential and prestigious event in the international translation and cultural community. As the host, we will leap at this opportunity to display our nation and boost our cultural strength,” said Huang. In August 2008, the FIT World Congress will be held for the first time in Asia. The Translators Association of China, the only national association in the field of translation in China and representing hundreds of thousands of translators and interpreters, is honored to be the host of the XVIII FIT World Congress. “Our success in winning the bid for the Congress is largely attributed to our nation’s stable political and economic environment as well as the great progress achieved in the translation field. It indicates that our efforts and merits in translation have received international recognition. This Congress will help the Chinese translation community gain greater say in this field and thus give weight to its development,” added Huang. During the bidding and preparing progress, the committee has been given great support by related central government authorities and the Shanghai municipality, as well as a host of prestigious enterprises and translators. Beijing Yuanpei Translation Co. Ltd. entered into a perpetual partnership with the Congress and has provided great human, material and financial support. 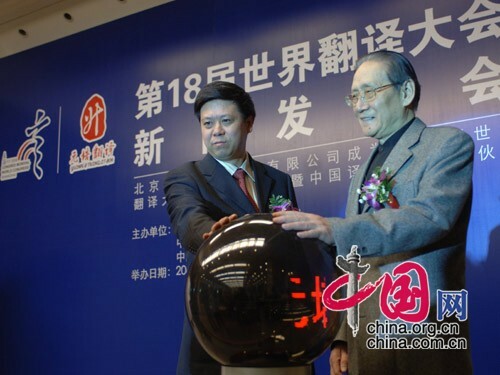 Jiang Xiaolin (L), the CEO of Beijing Yuanpei Co.Ltd. 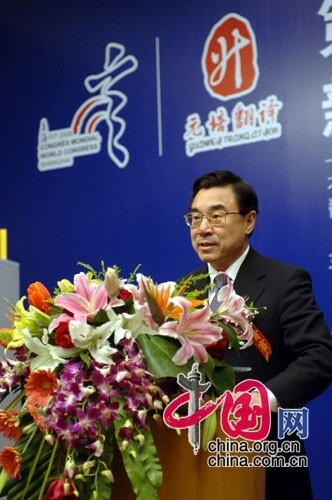 and Liu Xiliang, the chairman of Translators Association of China annouced the partnership at the ceremony. Huang added that the Congress has attracted attention from international organizations and translation communities. More than 30 international institutions including the UN, UNECO and European Commission will send delegates to the Congress. Among them, Yohannes Mengesha, assistant Secretary-General for the General Assembly and Conference Management and Karl-Johan (JUHANI) LÖnnroth, Director General, Directorate-General for Translation of the European Commission, will attend the Congress as keynote speakers. By the end of 2007, the committee had received 1,510 essays, one third of which are from foreign countries. 500 people from 68 countries have registered with the committee. “The registration work is still underway. It is estimated that this Congress will be the biggest ever staged, given its scale and the number of people who attend,” Huang said.